South Africans are yearning for a new leader in whom they can place their dwindling trust. As fate will have it, cometh the hour cometh the man, and it’s none other than Cyril Ramaphosa. He faces, what can be described as a herculean battle, to win the public and investor support. Analysts described the ANC’s choice of leader in December as a turning point for the country, not just the party. Now, Ramaphosa is in charge of both. Fifty-four million South Africans, and many others across the continent and the world, will shrewdly be watching his every pronouncement to determine whether the future will bring new hope or the continued disappointment that South Africans have become accustomed to. Hailing a “new dawn”, a day after his inauguration, President Ramaphosa has promised to fight corruption, which had weakened the state-owned enterprises in Africa’s most industrialised economy. He has declared that his government is committed to “policy certainty and consistency”. Many have agreed that one of the first major tasks for Ramaphosa will be to unite the ANC before the campaign for the 2019 General Elections gets underway. While the organisation’s political dominance remains fundamentally unthreatened by the opposition parties, the ANC must limit its losses—recent municipal polls saw serious setbacks—and avoid being forced into a coalition government. The undertaking will not be an effortless one, as to achieve this, the disaffected followers of Zuma will need to be co-opted, or marginalised—even though many remain in positions of power—and ideological disputes, that have split the ANC, remain largely unresolved. Ramaphosa accompanied released ANC political prisoners to Lusaka, Zambia in early-1990 and served as chairman of the historic National Reception committee, which co-ordinated arrangements for the release of Nelson Mandela and the subsequent welcome rallies within South Africa. Following the first fully democratic elections in 1994, Ramaphosa became a member of parliament and was elected as the chairperson of its Constitutional Assembly on 24 May 1994, playing a key position in the government of national unity. His background in law made him a valuable asset when drawing up the New Constitution of South Africa. However, after he lost a closely fought race with Thabo Mbeki to become President of South Africa, he resigned from his political positions in early-1997 and moved to the private sector. President Ramaphosa’s ascension to power was no walk in the park. The contest in the ANC was robust and, in some instances, contaminated with greed and corruption. During his address to the nation, he emphasised that “this is the year in which we will turn the tide of corruption in our public institutions. We are determined to build a society defined by decency and integrity, that does not tolerate the plunder of public resources, nor the theft by corporate criminals of the hard-earned savings of ordinary people”. Rampahosa is believed to have been Mandela’s preference for succession, however, it did not materialise as intended. The rise of Ramaphosa only affirms the wishes of Mandela and the qualities he saw in him. The economy is at crossroads, pigeon-holed by twin deficits, weak economic growth, high unemployment and an increasing inequality. The outlook for the economy has darkened precipitously in the past few years. The need for fresh, inspired leadership to transform our political economy cannot be overemphasised. Will President Ramaphosa turn the corner of our economic impasse? This is the million dollar question on everyone’s lips. In his speech, President Ramaphosa spoke of attending to many initiatives of growth and opportunity such as job creation‚ youth employment‚ rural economic stimulation and industrial hubs, and made the promise to address the dysfunctional mining charter‚ encourage small business incubation‚ expand agriculture and tourism‚ and address crime. “For several years, our economy has not grown at the pace needed to create enough jobs or to lift our people out of poverty. Public finances have been constrained, limiting the ability of the government to expand its investment in economic and social development. Tough decisions have to be made to close our fiscal gap, stabilise our debt and restore our state-owned enterprises to health,” said Ramaphosa. Shortly after Ramaphosa started his address, the South African rand surged, trading near its three-year best. Financial markets have rallied since Ramaphosa took over from Zuma as the ANC’s leader in December, as investors warmed to his covenant to pursue overseas investment. During his two decades within the private sector, Ramaphosa held executive positions on numerous JSE-listed companies where he built his wealth to become one of the more successful businessmen in South Africa. Some of his directorships include SA Breweries, Alexander Forbes, Medscheme Limited and FirstRand Limited. However, it was the founding of the black-owned investment holding company, Shanduka Group where Ramaphosa found much of his wealth. The group held investments not only in South Africa but also in Mozambique, Mauritius, Ghana and Nigeria. It also covered numerous industries including energy, telecoms, property and financial services, among others. The success of the Shanduka Group confirmed Ramaphosa as a skilled negotiator and dealmaker. These traits were learnt during his time in politics as a Labour Negotiator, and he successfully carried them out in his business interests. Despite all the success during his business ventures, there was also some controversy. In 2011, Lonmin, a mining company in which Ramaphosa was the non-executive chairman, was involved in an unprotected strike by mineworkers. This eventually led to what is now known as the Marikana Massacre—a strike that left 34 mineworkers dead at the hands of the police. However, in the ensuing court case, Ramaphosa was cleared of any misconduct. Ramaphosa’s two decades in the private sector have not only provided him with a good background to run for the presidency, but it has allowed him to build very good relationships within that sector, a sector that comes under great pressure within South Africa. In 2012, former President Jacob Zuma appointed Ramaphosa as his deputy, after he was elected as Vice-President within the ANC structures. This led to Ramaphosa resigning from most of his private-sector positions in order to avoid a conflict of interest. It was largely felt that Ramaphosa’s business acumen would stand the country in good stead whilst being second in charge. Ramaphosa was the Conference Organiser in the preparations leading up to the formation of the Congress of South African Trade Union (COSATU) and delivered a stirring keynote address at COSATU’s launch rally in Durban in December 1985. In March 1986, he was part of COSATU’s delegation, which met the African National Congress (ANC) in Lusaka, Zambia. In July 1986, after the declaration of the state of emergency, Ramaphosa went into hiding after the security police swoops on the homes and offices of the political activists. He travelled to the United Kingdom and appeared with NUM President, James Motlatsi, at a conference of the British National Union Mineworkers. He was later refused a passport to travel to Britain in 1987, but when he became the recipient of the Olof Palme prize, he was permitted to travel to Stockholm to receive it. The first clear indication of how Ramaphosa’s parliament will work came when he spoke about working together with everyone in the National Assembly, confirming that he will be reaching out to other parties to advance the interests of our people. He reminded everyone in parliament that they are here to serve those who elected them. Ramaphosa emphasised the need to take care of the poor and to diligently serve those “who cannot find work, who were forced to leave school, and whose taps do not work, regardless of a drought, as they are our people”. President Ramaphosa said that plans to expedite land reform using expropriation without compensation won’t involve “smash and grabs”. Nevertheless, it has to be done, he said, and should be seen not as a threat, but an opportunity. “We are all called upon and enjoined to heal the divisions and the pain of the past. And this is a collective task. It is not a task of the ANC alone; it is our task as a nation. It belongs to all of us,” he said. The president spelt out plans for better oversight and coordination of state-owned companies so that they can help to grow the economy instead of being a drain on the fiscus, and pledged swift action in terms of bringing down the cost of data, removing the red tape that is stifling small businesses and a crackdown to ensure the government pays its suppliers within 30 days. President Ramaphosa has confidence that a new social compact can be forged to turn the country around and deal with injustices of the past. He used his reply to debate on his State of the Nation Address to amplify his call for South Africans to unite behind efforts to revive the country from the challenges that hinder its growth. “Poverty and inequality will only be defeated by South Africans uniting behind a shared national agenda. I am confident that we can move with urgency and purpose to forge a new social compact to revive our economy, to create jobs, reduce inequality and effect fundamental social economic transformation,” he said. 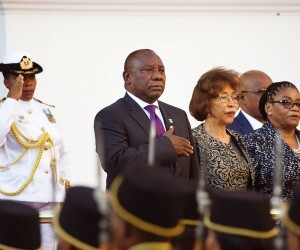 President Ramaphosa made reference to South African icons such as Nelson Mandela and Albertina Sisulu as pillars upon which to mould the new era of South African leadership. “We honour this son and this daughter of the African soil in a year of change, in a year of renewal, in a year of hope. “We honour them not only in word but, more importantly, in direct action towards the achievement of their shared vision of a better society. We should honour Madiba by putting behind us the era of discord, disunity and disillusionment. We should put behind us the era of diminishing trust in public institutions and weakened confidence in leaders. As we did our minds of all negativity, we should reaffirm our belief that South Africa belongs to all who live in it,” he said. He ended his speech by quoting trumpeter and singer, Hugh Masekela, known as the ‘father of South African jazz’, who used his music in the fight against Apartheid. “In his song, ‘Thuma Mina’, he anticipated a day of renewal, of new beginnings. He sang: ‘I wanna be there when the people start to turn it around’,” Ramaphosa said.